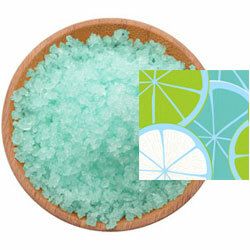 For a rejuvenating bath, try our Citrus Basil Bath Salts. The aromas of citrus and basil together create a refreshing and clean herbal scent that will awaken your senses. A fine/medium grain blend of Pacific Sea Salt with an herbal citrus basil scent in an aqua color.